Whilst the rest of the world struggles to find any growth at all, the economy in Africa is forging ahead at over 6% per annum. 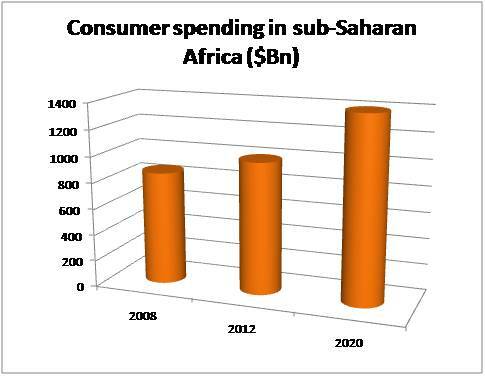 A recent McKinsey report highlights consumer spending in the region - $860 billion in 2008, climbing to $1 trillion today and forecast to hit $1.4 trillion by 2020. Within this the real stars are not the traditional bases for international companies of South Africa or the massive, oil-fuelled economy of Nigeria but rather East Africa, in particular Kenya. Why is this? Just like the runners it’s all about altitude and attitude. For height, read hi-tech and hi-speed. A decade ago the commercial climate was pretty unexciting, all about agricultural and mineral resources with any infrastructure investment, such as it was, focused around exporting bulk commodities. Whilst still immensely important to the backbone of country economies, the real opportunity lies in this domestic consumer market growth - and the exciting thing is that there is still plenty of headroom. What was once a major constraint in the region, the lack of half-way decent communications, has turned into an advantage. The whole region has leap-frogged the necessity for fixed local telecommunication links, jumping straight to mobile internet. Once the first big sub-sea cable landed at Mombasa from the Gulf in 2009, broadband became a reality. Coupled with an exponential growth in mobile phones this has transformed both personal and commercial communications. Internet usage has grown 2,000% in the last decade with the number of internet-enabled phones growing at 20% each year. Google, Microsoft, Nokia, Vodafone, and Intel amongst others have all chosen to base their Africa businesses in Kenya – so much so that work starts next year on Konza, a brand new cyber-city near Nairobi where Facebook will be one of the first to move in. Forget Barclays “revolutionary” mobile payment system in the UK – Kenyans have had this for several years already with over 17m people using M-Pesa. There is lots more to come with technology start-ups springing up across the country. Which leads to the second key factor – attitude. Of course East Africans are well-known for being entrepreneurial with the Nairobi universities in particular also producing a stream of highly-qualified graduates. Just as important is government attitude. Place to one side the received wisdom of ineffective governments, slow to act, hampered by bureaucracy, political instability and corruption – though some of that is certainly still present. Instead appreciate the urge to get out of the way and make things happen. There has been significant investment in transport and communications infrastructure – East African TVs went digital well before those in the UK. Regulators and officials are now working with an attitude of “how can I make this happen – faster?”. All this is driving high-speed growth in the technology sector – which in turn is fuelling the domestic consumer market boom. The opportunity in Africa is massive, but remember - you have to be in the race to win it!